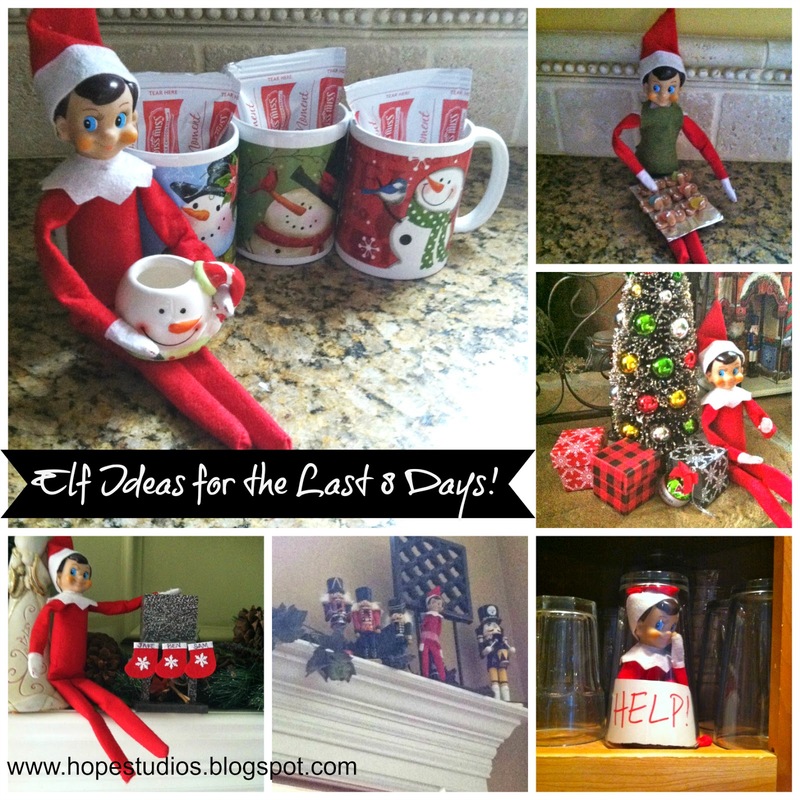 Hope Studios: The Last 8 Days of Elf Ideas! The Last 8 Days of Elf Ideas! My kids are older (12, 13, and 16) but the youngest still gets a kick out of searching for The Elf every morning. His humor is a little more sophisticated than a small child so I can get a little more imaginative. Um, we're parents, stress is where we live, people! If I can do something that takes me 5 minutes per day to make my kids smile I'm going to keep on doing it. Their happiness is my crack. Not even a bit sorry about that one. 1. In the cake decorating section, they have little sugar cake embellishments that look a lot like cookies. I picked some that resembled gingerbread men. I cut out a tiny apron from felt (no sewing!) and will set The Elf up with a tiny cookie sheet (cardboard covered with foil) near the oven. 2. I found a tiny 16" burlap tree and tiny ornaments he will decorate over night. 3. At my local Dollar Tree I found little ceramic houses that The Elf will set up as a little Christmas town one night while we're all asleep. 4. There are tiny ball ornaments with kids' names at Michael's Craft store and tiny gift boxes in their dollar section that will appear under the tiny tree one night. 5. Also in the Michael's dollar section, there are teeny tiny ceramic mugs. I got a snowman one that I will fill with hot chocolate and set him up near the tea pot. I added 3 snowman mugs for the boys with hot chocolate mix in them. 6. I have a nutcracker display waaay up on a shelf so I lined The Elf with the nutcracker soldiers and will sit back and laugh at how long it takes him to find it! 7. I trapped The Elf under a drinking glass with a sign reading "HELP!" 8. I found a tiny fireplace and glued tiny stockings to it with my boys' names on them. Good Luck and have fun with it! You are creating memories and there are only a few days left - go out strong!